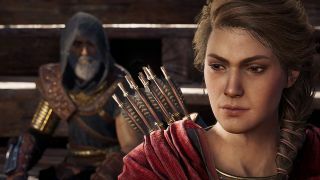 The latest development in the Assassin's Creed Odyssey Shadow Heritage DLC saga - in which the second chapter of the game's first expansion forced players into a heterosexual relationship to become a parent - is a more positive one. After engaging in discussions with the player base, and the LGBTQ charity GLAAD, Ubisoft has decided to retroactively make "changes to a cutscene and some dialogue in Shadow Heritage to better reflect the nature of the relationship for players selecting a non-romantic storyline." This news was announced on Assassin's Creed Odyssey's public forums by Community Manager UbiPhobos, who also explained that Ubisoft have been "carefully looking at the next episode, Bloodline, to ensure the paths that players experience mirror the choices they make in game". This update, alongside a patch that will change the name of the trophy that is awarded when the main character has their baby (currently titled "Growing Up"), is apparently coming soon, and will hopefully redeem some of the goodwill that Ubisoft has lost over this whole sorry affair. The last time a major developer went back to revise its own story in light of player demand was when BioWare modified Mass Effect 3 following the uproar over that game's ending, which failed to aptly recognise many of the choices players had made up until that point. At least Commander Shepherd didn't randomly end up cradling a baby by the end of that one, mind. Bloodline will round out Assassin's Creed Odyssey's Legacy of the First Blade expansion later this year, before the second major DLC chapter, The Fate of Atlantis, arrives sometime in the Spring.